This geographic assessment of Palestine is based on the assumption that the state's borders will conform to approximately the same lines as those which presently define the "West Bank" and the "Gaza Strip." Palestine's borders can be observed on the map at Figure 3. The state's eastern border is well defined by the Jordan River, starting slightly more than 30 kilometers south of the point from which the river exits the Sea of Galilee, and extending to approximately the mid-point of the Dead Sea. An abrupt range of mountains a few kilometers to the west of the river further defines the boundary and acts as a barrier to uninvited incursions. As the borders of the West Bank portion of the state curve around towards the west, however, they no longer follow specific geographic features, and must be statutorily defined. The western boundary of the Palestine's Gaza portion is the Mediterranean sea. To the south, east, and north, there are no clearly defined geographic boundaries. There are no geographical impediments to either trade or invasion along the western side of the West Bank and along the eastern border of Gaza. The security implications of this will be discussed further in Chapter 6, "Security." Though the mountainous areas tend to make travel and communications more difficult, the distances within Palestine are such that geography tends to have little significant impact on internal or external commerce. However, the physical separation between Gaza and the West Bank could present almost insurmountable problems, especially if Israel were to adopt a hostile posture. For this reason, most plans for creation of a Palestine state postulate a land corridor linking the two. This corridor would be just over 30 kilometers long, and two to four kilometers wide. 3 Further implications of the corridor will be discussed under "Transportation and Communications Infrastructure" in Chapter 8. The diverse terrain, particularly the steep mountainous and hilly areas greatly effect land usage. Nearly a third of Palestine's land is of marginal or no value for agriculture because of sharp gradients, rockiness, alkalinity, or aridity. The mountains, however, counter some of their disadvantage by catching moisture-laden clouds and coaxing precipitation from them. Palestine has a surprising variation in climate for a country of relatively small area. Overall, it possesses a Mediterranean climate, with long, hot summers, and short, mild winters. The Jordan valley, however, is significantly hotter and drier, while the highland region stays noticeably milder in the summer, and has been known to receive significant quantities of snow in occasional winter storms. Located at a point where three continents come together, Palestine is at an historical nexus of cultural ferment, trade routes, and war. It is sandwiched between two logical trading partners, Israel and Jordan, and has access through Jordan to Saudi Arabia, Iraq, and the Arabian Gulf states. With a future port in Gaza, it will have further access to Europe, North Africa, and the Western Hemisphere. What might be from some aspects an enviable location has its drawbacks as well. It is vulnerable to invasion from several different quarters, and could find itself in frantic economic competition with its neighbors for the same markets with the same products. The Jordan River system is the only water course of any significance. Averaging only about a meter in depth, the river is of no consequence as a waterway, but is important as a source of water for domestic, farm, and industrial use. The largest body of water contiguous to Palestine is the Dead Sea. It also is unimportant for transportation, but may be a source for mineral exploitation and tourism. A number of desert wadis provide drainage during periods of significant precipitation. A comparatively long, convoluted, vulnerable border with Israel; a more defensible border with Jordan. The situation would be better were things reversed. Terrain makes some areas difficult to farm and presents some impediments to travel, but also provides a climatic variations and some defensible areas. Warm summers, mild winters, and some areas of adequate rainfall provide a climate conducive to agriculture and supportive of tourism. Location is good for trade, communications, and transportation (once airport and ports facilities are developed); but high vulnerability to attack from surrounding territory in event of hostilities. The Jordan River system provides water, but is unimportant for transportation. There are no other significant waterways. Gaza shore provides adequate access to Mediterranean Sea, but coastline provides no natural sheltered anchorages--developing a port would require major construction. 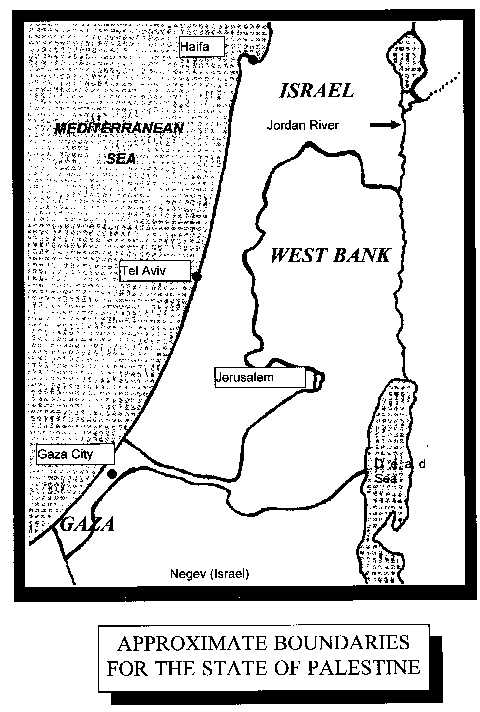 Palestine Studies Project, Masterplanning the State of Palestine, (Ramallah: Center for Engineering and Planning, March 1992), 12. Comparison derived from data compiled in Willy Rudloff, World Climate, (Stuttgart: Wissenschaftliche Verlagsgesellschaft, 1989), 234 and 142; and James A. Ruffner and Frank E. Bair, eds., The Weather Almanac, (Detroit: Gale Research Co., 1977), 373 and 645.